and two prototype Comets, G-ALVG and G-ALZK. The de Havilland Comet 1 Aircraft experienced a series of inflight breakups before it was discovered that the fuselage fatigue life was far shorter than testing had revealed. BOAC Flight 783 departed Calcutta, India on a flight to Delhi, amidst severe rain and thunderstorms, with 43 passengers and crew members. Six minutes after takeoff, while climbing to 7,500 feet, the plane experienced an in-flight break-up and crashed, killing all on board. The investigators concluded that the airplane's structure had failed due to overstress by either severe gusts from the storm, or due to over-control of the airplane by the pilot while trying to fly through the storm. 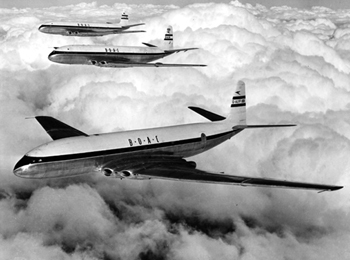 This was the first in a series of three structural break-up accidents of the Comet aircraft. BOAC Flight 781 departed Rome, Italy on a flight to London, England. While climbing through 27,000 feet, the plane experienced a sudden in-flight break-up and crashed into the Mediterranean Sea near the Island of Elba. All 35 passengers and crew on board were killed. Following this accident, the Comet fleet was taken from service and subjected to numerous modifications in areas believed to have been the origin of the yet-unknown failure. The fleet was returned to service in late March 1954. SAA Flight 201, contracted through BOAC, departed Rome, Italy for Cairo, Egypt. While climbing to 35,000 feet, the airplane experienced an in-flight break-up and crashed into the Mediterranean Sea, killing all 21 passengers and crew. Although only minimal wreckage was able to be recovered, the similarity to the Elba accident led investigators to conclude that the cause of this accident was most likely the same. The Certificate of Airworthiness was withdrawn from all Comet aircraft and the fleet was subsequently grounded indefinitely. Investigative testing, with concurrence from extensive examination of the Elba wreckage, revealed that the relatively squarish windows were creating stress concentrations much higher than anticipated. These stress concentrations fatigued the material around the window corners, which would quickly lead to a rupture of the fuselage.